Tom Stewart, a jazz pianist who lives and works in an island lighthouse, is about to be married to the wholesome Meg, but receives a visit from his old flame and former singer Vi, who isn't about to leave their relationship buried in the past. During an argument, a piece of lighthouse railing breaks free, and Vi hangs for dear life onto the twisted piece of steel. Tom purposely hesitates to save her before the metal gives way, and she falls to her death in the rocky shore below, thus ensuring that Vi is out of his new life for good. However, Tom finds out that the old phrase "Hell hath no fury like a woman scorned" also applies even in death. This engaging little ghost story is a change of pace from Bert I. Gordon, best known for his movies featuring giant monsters (such as Cyclops or The Amazing Colossal Man) or giant bugs (Beginning of the End; Earth Vs. The Spider). Those films are also notorious for the primitive special effects (which either featured normal sized animals running around glaringly obvious miniature sets, or showed obvious matte lines) usually designed by Gordon himself. Likewise, Tormented has moments with crude super-impositions as Vi's ghost comes back to taunt Tom. But this movie perhaps works better than those that give Mr. B.I.G. his namesake, because there is still a good movie without the effects. 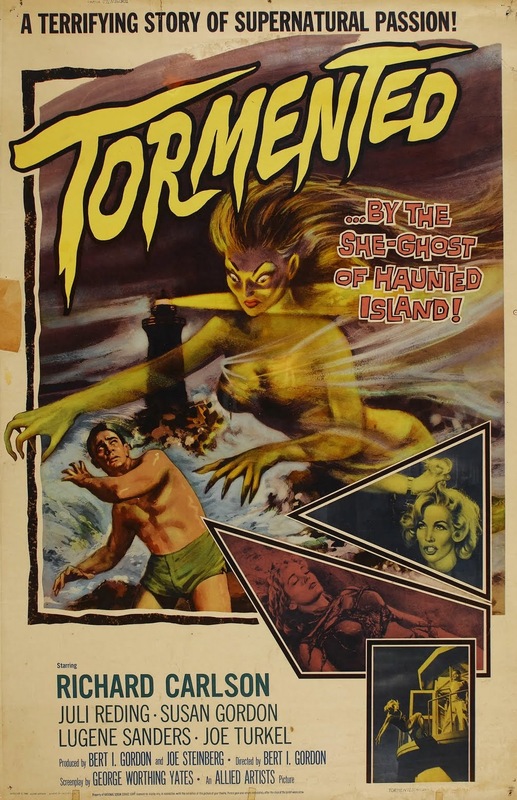 I first saw Tormented on The Cat's Pajamas (pause- sigh) on their Sunday "Science Fiction Horror Night" program just before Christmas of 1985, shown with Roger Corman's The Wasp Woman (and found it to be far more inventive and creepy than the latter). In 2006, I programmed this film as part of the Creepy Kooky Double Bill screening in October of that year; surprisingly, it became the hit of the evening over the headliner- another Roger Corman film (Creature from the Haunted Sea). 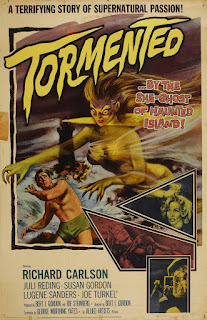 Even more surprisingly, despite that this little horror gem has been circulating in the public domain for years, no-one in that night's audience had yet seen it! It was a delight to see that this movie still worked with an audience. Because it doesn't rely so much upon dated technical effects to deliver the goods, this movie succeeds as a mood piece about guilt. Tom is essentially a good man who yearns for a wholesome lifestyle, yet is now paying the price for a single stupid act. Whether it is due to ghostly encounters that only Tom sees, or that her watch shows up on the beach, his new life is constantly dismantled due to his momentary lapse of judgment. Further, he is being blackmailed by a jive-talking ship captain who initially chartered Vi onto the island, and knows that she never returned, especially in light of Tom's upcoming marriage. Despite all of this, we care enough about Tom to wonder how he'll get out of his plight. However, the heart of the movie actually belongs to Sandy, Meg's younger sister, who has a great friendship with Tom- it is largely through her eyes that we see his character change from a passionate human being to a paranoiac who will stop at nothing to erase the memory of Vi on this island. And once she knows too much, will her life be endangered as well? Admittedly, I re-watched this movie the other night in memory of Susan Gordon, daughter of the director, who passed away this month. Yet, I was surprised to discover that I had remembered absolutely nothing of her substantial role as Sandy. 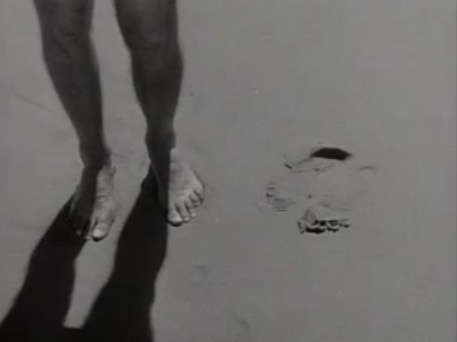 (In truth, it is Joe Turkel's beatnik blackmailer who steals the picture performance-wise.) Instead, one more recalls this film for the visceral experience it produces- its atmosphere is conveyed through such subtleties as shadows, wind, cold, shredded garments. I must also confess that I have an affinity for suspense films which are set on shorelines (The Fog; Play Misty For Me)- something about the waves and the wind, plus the elements of forbidden desire that the milieu recalls, and perhaps I value this picture more than others do for these ingredients. As such, this movie benefits greatly from its atmosphere: its setting upon an island detached from the rest of the physical world adds to the feelings of despair and helplessness. 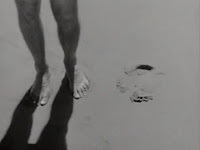 However, there is a great visual touch that I've always remembered from my first viewing 26 years ago: in one sequence on the beach, we see a pair of footprints gradually appearing in the sand next to Tom. Low-key touches such as this make Tormented much than what it is: a programmer designed for a quick sell to the drive-in circuit. The movie is so fun that you forget the odd casting troika of 48 year-old Richard Carlson, 26 year-old Lugene Sanders (as his fiancée) and 11 year-old Susan Gordon. (She's young enough to play his granddaughter.) Although I watch Gordon's Empire of the Ants every Christmas Eve while I wrap gifts, perhaps his superior films are those peculiar fables which do not rely upon giant monsters or colossal men. It may be time to revisit such works as Picture Mommy Dead and The Magic Sword to re-evaluate where Gordon's talent truly lies.